Tharuni Warangal in collaboration with Girls Advocacy Alliance Project, conducted one day Interaction Meeting between VLCPCs and the Line Departments of the Government, at Gangadevipalli of Geesukonda Mandal, on 17th March 2017.District Welfare Officer (Wgl.Rural)Smt. Sabitha was the Chief Guest for the Meeting. Sri Mahender DCPO- ICPS, and sri Ravinder EOPRD of Geesukonda have given their valuable advice, to protect and empower the girl child.State Communication Officer of Tharuni Anuradha addressed the participants on the importance and objectives of the GAA Project. Secretaries of Panchayat Raj, Sarpanches of Geesukonda and Duggondi Mandals and line Department Officials participated in the Meeting. 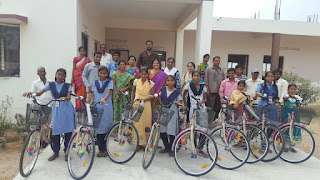 Tharuni also distributed 10 Cycles to the School going Girls, under the Cycle to School Project. 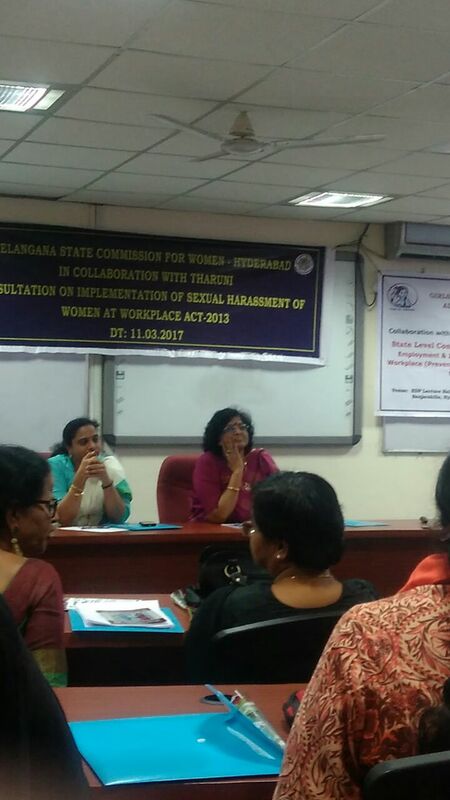 Tharuni, Terres des Hommes in collaboration with Telangana State Women Commission, organised a Consultation on the Sexual Harassment at Work Place against Women(Prevention,Prohibition & Redressal)-Act of 2013 and Guidelines issued by Government on 28-12-2016, at ASCI, Hyderabad Dr. Mamatha Raghuveer, Founder Tharuni and Dr. Thripurana Venkatratnam, Chair Person, TSSWC,presented the implementation of the Act and its Challenges in detail.Dr. Mamatha explained the Act in detail. 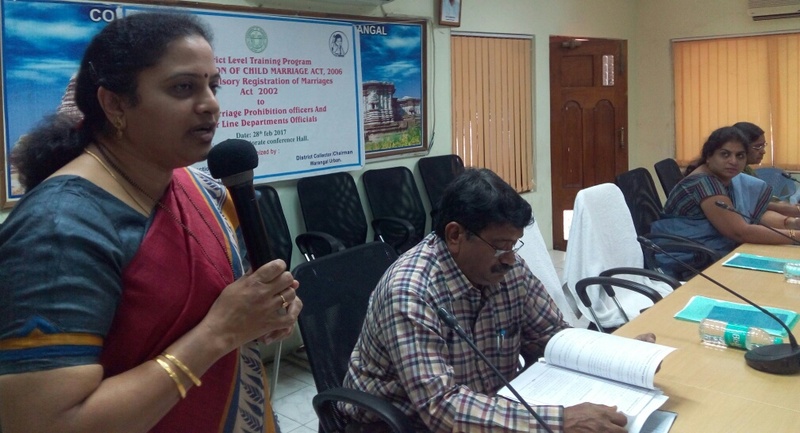 Dr. Thripurana Venkatrathnam reiterated the importance of local Complaints Committee to be established in each District, under the supervision of District Collector.She also stated that Internal Complaints Committees must be formulated in Schools and colleges, under the Act. The participants in the Meeting include NGOs, ICC Members of different Companies, Advocates and Government Officials. They have had interaction to suggest and recommend against the lacunae in the Act . Dr. Mamatha Raghuveer had noted their suggestions and assured to send a Report to the Government, very soon. 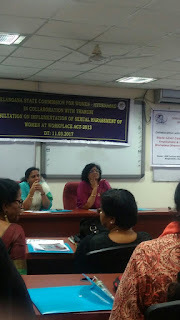 Tharuni in collaboration with Girls Advocacy Alliance at Warangal, celebrated International Women's Day. One Thousand Students from Schools and Colleges, Balika Sanghas, participated in the Rallies and the Meeting. District collector, Urban Warangal Amrapali, Municipal Commissioner Shruthi Jha and Sudheer Babu ,I.P.S. and other Officials from different Departments and Tharuni Team participated in the event. The speakers reiterated the important role a woman plays in upbringing the future generation.Every woman/ Tharuni should aspire to become big, with a goal in life, to achieve, they said.